Blastocyst culture is standard practice at Fertility Solutions, especially when a couple have two or more embryos fertilised. Blastocyst is the name given to an embryo which is continuing to develop approximately 5 days after the egg/s and sperm have been placed together. A blastocyst contains anywhere from 80 to 150 cells, which is a huge effort given an embryo at Day 3 generally has around 7-10 cells. Unlike an embryo at Day 2-3, two distinctive types of cells form the embryo at the blastocyst stage, an outer mass of cells (known as the Trophectoderm) lining the inside of the egg shell and an inner mass of cells (known as the inner cell mass or ICM). The trophectoderm cells will become the placenta, umbilical cord and membranes (the support structures of a pregnancy) whilst the ICM is the early stages of the potential fetus. The major benefit of culturing an embryo to Day 5 or blastocyst stage is the ability to select the best quality embryo for embryo transfer. 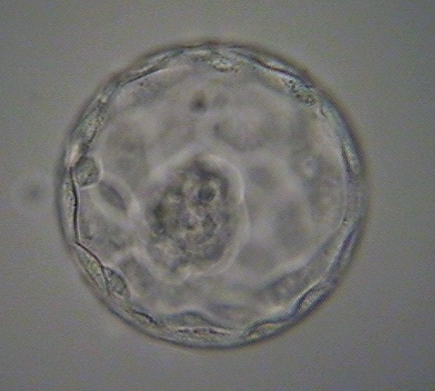 Some embryos will grow until Day 2 or 3 and look perfectly normal, but do not progress after this stage. Having and embryo transfer on Day 5 will decrease your chance that an embryo that would not survive to the Blastocyst stage will be transferred. Another potential benefit of transferring a blastocyst embryo is that a blastocyst may have a better potential to implant into the uterine wall. In a natural period cycle it is usually Day 5 when the embryo moves out of the fallopian tube and into the uterus. It has therefore been said that transferring an embryo at this stage into the uterus is more similar to a natural cycle. If an embryo survives until Day 5, it is more likely to be genetically normal. However, this does not mean that all blastocysts are genetically normal. Studies have shown that if an embryo survives to Day 5, it has an increased chance of becoming a viable pregnancy, compared with a 2-3 day old embryo. Blastocysts can be frozen and stored using a rapid freezing technique known as vitrification and this technique comes with improved embryo survival and pregnancy rates (in subsequent frozen cycles (FET)) as good as those you could expect for a fresh embryo transfer (ET). Some fertility experts consider that the woman’s uterus is the best incubator and therefore embryos should be put into this natural environment as soon as possible ie Day 2 or 3. The culture systems used at Fertility Solutions are tailored towards the conditions required for optimum blastocyst development however it is still an artificial environment which will never be exactly the same as the uterine environment, and the impact this may have can never be fully calculated. On average between 30-60% percent of embryos which fertilise (not to be confused with the number of eggs collected initially) will not survive until Day 5. This is a normal part of natural selection and is not specific to Assisted Reproductive Technologies alone. This leads to an increased chance that there may be no embryos which reach the blastocyst stage by Day 5 and thus nothing suitable for embryo transfer or freezing compared with about 95% of embryos still being suitable for transfer Day 2/3. Who Would Benefit From Blastocyst Culture? Couples who have 3 or more embryos fertilise. This allows the scientist selecting the embryo for transfer as much information as possible. Extended culture will allow those embryos not going to make a pregnancy to be selected out leaving the strongest and fittest and therefore the most likely to implant. It is important to know that even a single embryo can still be cultured to blastocyst if that is what you wish. If you and partner have any questions as to whether blastocyst culture is for you please contact us or phone 1300 337 845 (1300 FERTILITY) to arrange a time to speak to one of our scientists. It is also worth noting that scientific information, advice and support particular to your cycle will be offered throughout the days following your egg retrieval up until your embryo transfer and freezing assessment. Situations often change and are almost always particular to a couple and the best advice can only be given at the time.